Increased power and performance, a new cab providing class-leading levels of comfort and all-round visibility, and a fully hydrostatic steering system – a ‘first’ for a high-speed tractor – are among the key features of the new JCB Fastrac 8290 and 8330 that make their public debut at LAMMA 2017. The new tractors represent a significant step up in performance with heavy draft equipment, demanding pto-driven implements and heavy trailers, tankers and spreaders, with the 8330 clearly being the most productive Fastrac ever built. The new-look machines share their styling and a number of features with the highly successful 175-235hp Fastrac 4000 Series tractors but are clearly in a different performance league. 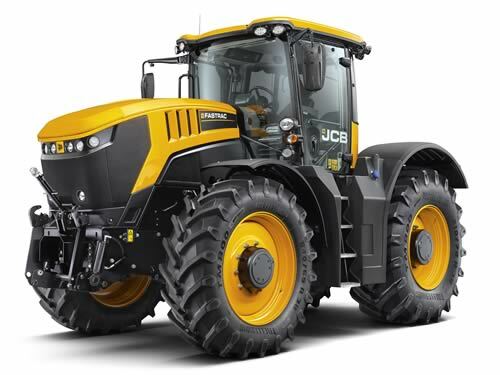 The Fastrac 8290 is powered an 8.4-litre six-cylinder engine developing peak output of 228kW (306hp), while in the Fastrac 8330 this twin turbo engine is tuned for 260kW (348hp). That is 32kW (42hp) or 14% up on its predecessor, with 1440Nm of torque (10% more) at just 1500rpm enabling the tractor to ‘hang on’ when faced with an increasing load or an incline, whether on the road or in the field. A multi-mode CVT transmission with bespoke JCB control software provides the operator with different powertrain control strategies for maximum performance, economy or consistent ground or pto speeds. There is even a choice of seamless speed adjustment or the unique ‘powershift’ mode that adjusts ground speed in steps. During heavy draft applications, JCB Activ Traction draws information from a radar speed sensor, hydraulics position control and cruise control to manipulate engine torque and maintain traction for the most cost-efficient performance, making the most of the Fastrac’s unique balanced weight distribution. In other situations, selective brake actuation prevents one wheel from spinning on a loose or uneven surface. Another advanced feature – JCB Hill Hold – automatically keeps the service brakes applied after the operator has brought the tractor to a halt (at a road junction, for example) and releases them only once the transmission is activated when the way is clear to move off. A unique dual circuit hydrostatic steering system and transmission-driven emergency pump provide essential fail-safe protection in light of the tractor’s 70kph top speed. In normal use, the new steering arrangement requires less effort at the wheel during low-speed manoeuvres without diminishing the precision required for high speed road travel, while the four-wheel external disc brakes give the secure anti-lock braking performance for which all Fastrac tractors are renowned. Another new feature – JCB Rapid Steer – halves the number of turns lock-to-lock when engaged, making life easier for the operator during headland turns and other manoeuvres below 10kph. The steering system is compatible with satellite guidance for precision hands-free bout matching. The new Command Plus cab provides space, comfort and practicality in abundance, with deep door glass and side windows, and wide lower windscreen glazing, providing good visibility all round, as well as natural ventilation through the opening rear three-quarter windows. Being able to swivel the driver’s seat 50 degrees to the right and 20 degrees left will be welcomed by operators needing to keep an eye on rear-mounted and trailed equipment, while the forward-raked cab structure not only adds to the sense of interior space but also improves visibility and cab access. The JCB LiveLink telematics system is standard on both of the new Fastrac 8000 Series tractors, providing valuable location and operating information, as well as proactive service scheduling, remote fault finding and anti-theft features.